Build Bigger Biceps: Training Guide To Perfect Your Pythons! Let's face it-everyone wants bigger 'guns'. Walking around with water-pistols isn't going to turn heads. You want the size, you want the peak... Here's what you need to make those pythons dangerous. Learn more. You can&apos;t change your genetics, but you get the best of what you have. 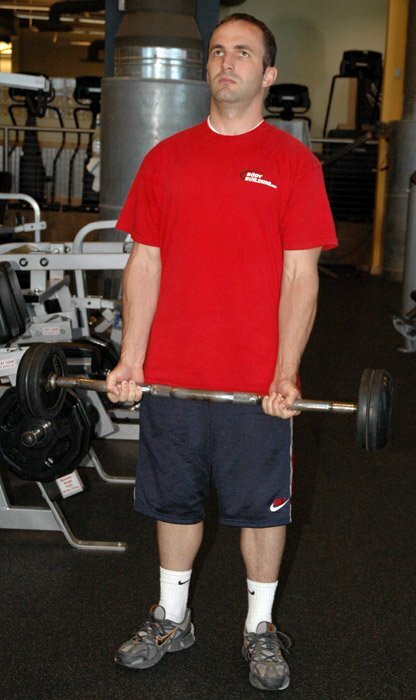 The barbell curl is the staple of any biceps workout. Knowing what type of workout works for you is half the battle. Training Guide To Perfect Your Pythons! Let&apos;s face it - everyone wants bigger "guns". Walking around with water-pistols isn&apos;t going to turn heads. You want the size, you want the peak... so what&apos;s holding you back? Genetics? To a degree. Specific biceps workout for growth? Good possibility! I have good news, and I have bad news. Let&apos;s start with the bad news because I think the good news will outweigh the bad. Bad news is that you can&apos;t change your genetics. If you have short muscle belly&apos;s or long muscle belly&apos;s that isn&apos;t going to change at all no matter how hard you try. Those are genetics and you are either blessed or screwed. If you are screwed, here comes the good news. There are workouts to at least help you put on some nice size gains and add some peak to your biceps. Read through this article and you will be on your way to understanding how to make those pythons dangerous. I first want to share with you something I wrote a while back on the biceps to help you first understand the anatomy of the muscle itself. That way you at least are learning a little bit about the human body since you are working on perfecting it. [ Click here to learn more. ] Biceps Building 101! This introduction will give details about anatomy of the Biceps, different parts, exercises, and workouts. Get the details right here! The biceps brachii is given the name biceps because it has two heads, and brachii comes from the Latin word for arm. The short head of the biceps attaches to the coracoid process of the scapula. The tendon of the long head passes into the joint capsule at the head of the humerus, and attaches on the scapula at the supraglenoid tubercle. Distally, biceps attaches to the radial tuberosity. The biceps also connects with the fascia of the medial side of the arm, at the bicipital aponeurosis. The biceps brachii is a muscle on the upper arm that acts to flex the elbow. Since the biceps is attached to the radial tuberosity, this bone can rotate which allows the biceps to also supinate the forearm. It arises from the distal, anterior half of the humerus and the intermuscular septa. It inserts into the coronoid process and tuberosity of the ulna over the elbow joint. In this first episode, the dudes over at Scivation explain their new 666 training system, blasting their biceps with some high-volume, short rest period training using bicep curls for 6 sets of 6 reps in 6 minutes flat! The brachialis is the main flexor of the forearm. It arises from the distal end of the medial humerus and the medial part of the ulna. From there it inserts into the lateral side of the radius. The job of the pronator teres is to pronate at the forearm and to also flex the forearm at the elbow. If size is what you want then you can&apos;t go wrong with the straight barbell curl. That exercise needs to be a staple in your biceps training. 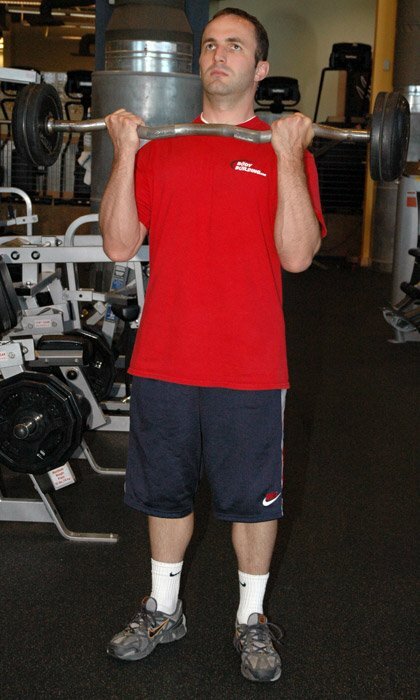 Load up the weight (maintain good form) and hit it hard. If you find the straight barbell causes some wrist pain, simply switch out the straight bar with the EZ bar which will put your wrists in a more natural position. Something you want to remember is to maintain proper form throughout each movement. If you find yourself swaying back and forth to throw the weight up, it&apos;s too heavy and you need to drop it down a little. A little cheating here and there on the last rep or so is ok, but when you&apos;re swaying on rep one you have problems. Another important thing to remember is to visualize the muscle working. Create a good mind-muscle connection and visualize the muscle contracting and lengthening. If you can&apos;t feel the muscle working then your form is not correct. When in doubt, ask a personal trainer or someone around you to watch your form to make sure you have the movement down correctly. The key to building bigger biceps is to incorporate a variety of exercises to hit the muscle different ways. You always want to keep the muscle guessing because just like everything else, your muscles will adapt to a certain workout or exercise and will not stimulate the fibers in a way that will make them want to grow. [ Click here to learn more. ] Unstoppable Arm Size! A set of guns that stretch shirt sleeves to the bursting point grab attention like nothing else. Achieve startling new growth from the following tips and workout..
You always want to start off your biceps workout with a heavy movement like the barbell curl. Early in your workout you are fresh and can handle a little heavier workload when compared to later on in the workout when your muscles are fatigued and the lactic acid build-up is more prevalent. Everyone is different when it comes to results from training protocols. Some people respond better to high volume training, some don&apos;t. Some people respond better in a rep range between 8-10, some find better results from 12-15. What I&apos;m getting at is I do not have the answer for you in terms of getting you the results you so desire without working with you one-on-one and getting to know how your body reacts to the training styles. With that being said, figuring out what works best for you is half the battle and half the fun. If everyone responded the same way, we would all be cutting off our shirt sleeves, but look around! You Is Half The Battle. Obviously others haven&apos;t figured it out either. So below you will find many different workouts that you can try out and see how you respond. Try anywhere from 3-5 sets of each exercise with the reps between 8-15. Keep mixing it up to see how your muscles recover and grow. It&apos;s ok to be a little sore the next day, shows you worked the muscle. Afterwards it&apos;s time to feed and rest the muscle. All those things considered, the next thing to happen is growth. Click Here For A Printable Log Of Workout #6. Click Here For A Printable Log Of Workout #7. Click Here For A Printable Log Of Workout #8. Click Here For A Printable Log Of Workout #9. Click Here For A Printable Log Of Workout #10. Click Here For A Printable Log Of Workout #11. Click Here For A Printable Log Of Workout #12. Click Here For A Printable Log Of Workout #13. Click Here For A Printable Log Of Workout #14. Click Here For A Printable Log Of Workout #15. Click Here For A Printable Log Of Workout #16. Click Here For A Printable Log Of Workout #17. Click Here For A Printable Log Of Workout #18. Click Here For A Printable Log Of Workout #19. Click Here For A Printable Log Of Workout #20.